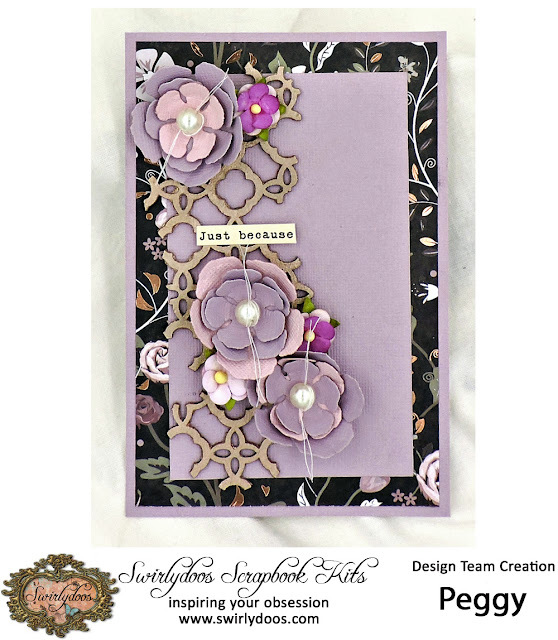 I'm now hosting the Swirlydoos Card Challenge; this month, it's all about "stitches"! Curious? Why not stop by and see what it's all about? The first card features machine stitches. I cut a piece of Purple Moon cardstock to 5" x 7", a piece of April Lovely cardstock to 4⅞" x 6⅞" and a piece of the Midnight Beauty paper to 4¾" x 6¾" and adhered them in the center with a little bit of glue. (I only glued the center; I didn't want any adhesive to get on the needle.) Then, I simply used my sewing machine to create some fancy stitching around the border. A resin frame, some blooms and a sentiment from my stash and I was done! For my second card, I wanted to feature hand stitching. First, I layered more of the Purple Moon cardstock, cut to 4" x 6" and 3" x 5", with a 3¾" x 5¾" piece of Midnight Beauty in between. 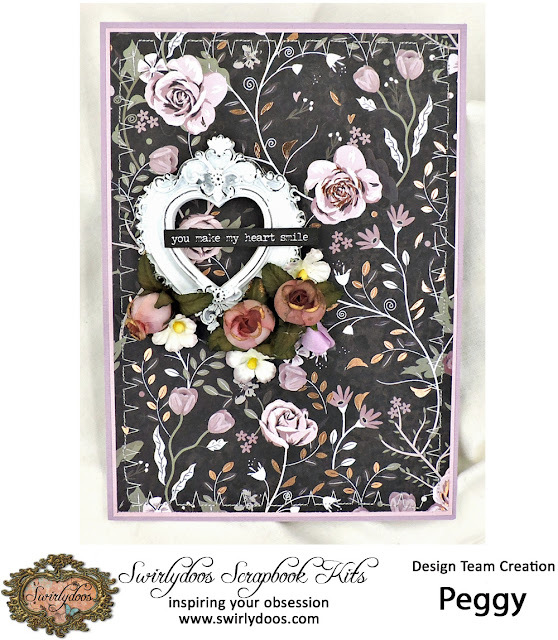 I applied some DecoArt Metallic Lustre to a bit of chipboard from my stash to create a background for my flowers: the smaller ones from Wild Orchid, the larger ones die cut and layered. Oh, yes, the hand stitching: rather than sewing around the border, I decided to take my needle and thread and add a bit of interest to my pearl centers by passing the needle though twice and leaving bits of thread "tails". My third card, which is also being used as an example for the August ATF Challenge, features faux stitching, a technique that I learned from Rae Moses. First, I cut a piece of the April Lovely cardstock to 5" x 7", then another piece of the Midnight Beauty paper to 4¾" x 6¾". I flipped the pattern paper over; the "stitching" shows up much better on the lighter color. 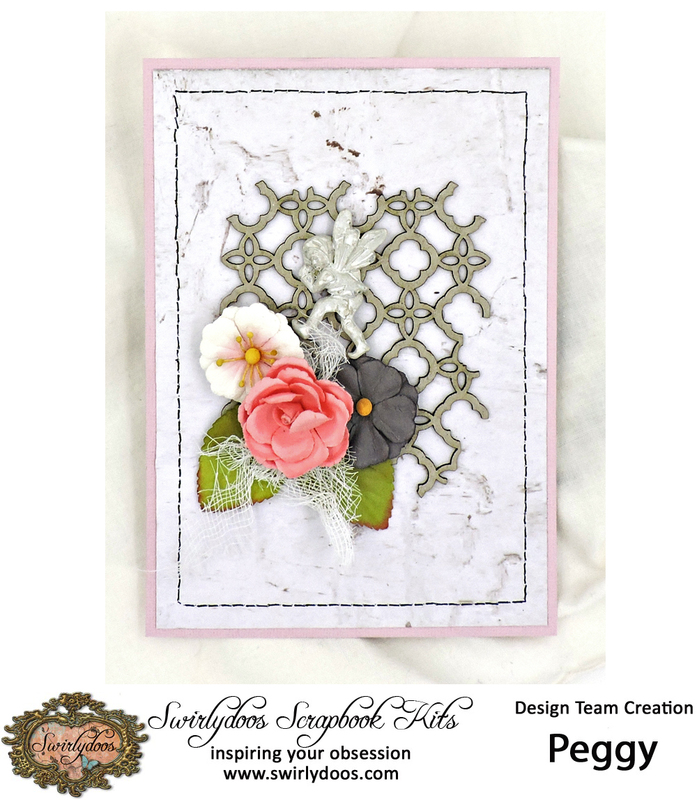 To create the effect, I simply used a tracing wheel to create a pattern of holes around the border. (You can create the same effect with a craft pick or a heavy needle.) Next, I took a gel pen and drew lines between the holes. I deliberately did not aim for perfection here; I wanted to create the look of actual hand stitching. When this was done, I glued the paper to the cardstock and added some more of the chipboard (I left this one bare). A few blooms from the May Swirlydoos kit, some bits of cheesecloth, and a garden fairy that I've had forever completed my card. These cards were so quick and easy to create; I hope I've inspired you to do some stitching of your own.